One Fat Frog Restaurant Equipment of Orlando has several makes and models of used ice machines available. Sometimes ice machines are largely ignored in the back of the house – as long as ice machines keep producing ice in the quantities needed, their maintenance is overlooked. It’s important to clean your ice machine regularly though. Ice can sit in the bin for a while and absorb odors and other contaminating things. Here’s some quick tips for keeping your ice machine and the ice it produces clean and up to spec! Regardless of the machine’s capacity, ice will inevitably sit in a storage bin for a little while until it is used. The bin can absorb odors over time and contaminate the ice. To avoid this, sanitize the bin every day. Empty the ice and wipe down the bin with the manufacturer’s recommended cleaning solution. Make sure to get all sides and seals. While the bin is empty, run a deliming agent through the unit to dissolve the buildup of calcium, magnesium, and other water deposits in the lines. Deliming should be done at lease twice a year or quarterly for heavily used machines. It’s also a good idea to clean the coils and filter the water consistently. 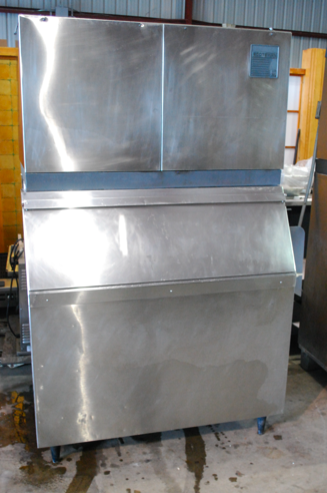 One Fat Frog Restaurant Equipment has several different makes and models of used ice machine available. One Fat Frog Restaurant Equipment can get you financed for all of the used commercial restaurant equipment you need including used ice machines. One Fat Frog Restaurant Equipment offers quick cash and package deals on the entire stock of used restaurant equipment including ice machines! Come into One Fat Frog Restaurant Equipment today! ← Cash Paid for Used Restaurant Equipment!